Paska Easter Bread Recipe - Kulich - Let the Baking Begin! Easter Bread recipe is just what you need this upcoming Easter. It is made of very flavorful, moist, buttery, lightly sweetened brioche, that’s studded with beautiful morsels of white chocolate and rum soaked dried berries. You can eat it as is with coffee or tea for breakfast, or use it for the best tasting French toast. A mix between Italian Panettone and French Brioche, this Paska is a traditional Russian Easter Bread. I hope you give it a try and fall in love with this delicious Easter tradition just like our family has! This Easter Bread can be baked in many sizes, from minis to medium-sized, to a large and beautiful cake-like Paska. 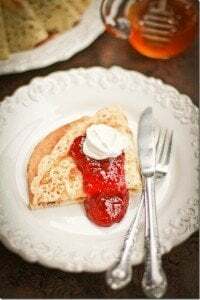 Over the last couple of weeks, I have taken the time to test and perfect this recipe until I got exactly what I wanted and exactly what this traditional Russian Paska recipe should be. If you follow my Instagram, you’ve seen it for yourself. If you don’t you can still check it out in the story Highlights. Paska is what many Ukrainians and other Eastern Europeans call their Easter Bread. In Russia, they call it Kulich. Typical Paska Easter Bread is made with eggs, flour, sugar and lots of butter and is similar to Italian Panettone. When this dessert bread is made properly it will be light and fluffy, but still somewhat moist. There are many recipes for Paska, but one requirement that they all have is for the bread to be tall. To achieve the height, Ukrainians use tall lined coffee cans or other smaller sized cans for baking tall Paskas. Then, the bread is topped with thick white powdered sugar glaze and sprinkled with sprinkles. Not many people have the time to test the recipe dozens of times, just to make sure it’s perfect, but I have! 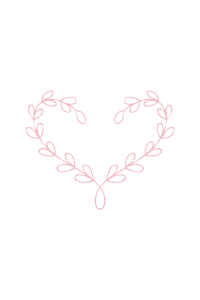 I’m super excited for you to try a truly amazing Paska recipe since it is indeed perfect. This Easter Bread is made with lots of butter, which keeps the bread from going hard and stale for more than a week! Soaking the dried fruits for several days before using them in the Easter Bread allows them to plump up and fill with rum or water. Then, once they’re baked in the bread they continue to give off moisture into the bread, preventing the bread itself from drying out. This Easter Bread uses a basic brioche bread recipe which I posted about HERE. Go on and read all the tips and tricks on how to get the best results when working with enriched yeast dough. Can this dough be used for Hot Cross Buns? Sure thing! Just divide the dough into 12 round balls and bake in a 9″x12″ baking pan. Use the powdered sugar glaze from the recipe to pipe the cross pattern on top of the buns after they cool. This Paska bread is made with golden raisins, dried sultans and white chocolate. The yellow flesh of the Easter bread is due to all the egg yolks in the recipe. The more yellow the egg yolks, the more yellow the bread. Among my trial runs there was a batch made in the bread maker as well. It’s definitely possible to just load up the ingredients, mix in the butter and salt in the later stages and lastly add the dried fruits and chocolate (I describe the method in the Brioche Bread post). 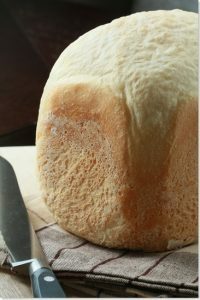 But, removing the bread out of the bread maker immediately after baking can cause it to lose its’ perfect shape since the dough is extremely delicate. The flavor is all there, so it’s only the aesthetics that suffer. If you were to make it in the bread maker, use the “white bread” setting for a 2 lb loaf. Do not use the quick bread setting for this recipe. Bread maker IS the best for mixing the Paska dough though, so if you have the bread maker use it to knead the dough, for sure! 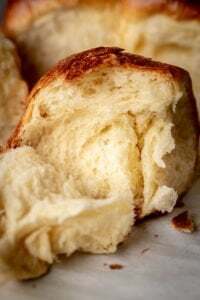 Read about how I use the bread maker in the post about making Brioche Dough. Make sure your yeast is active before starting. Starting with yeast that is old or inactive will not produce the needed rise for light and fluffy Paska. If you can, use the Platinum yeast. It’s very forgiving and gives the best rise in baked goods. Soak your dried fruits well in advance. The fruits that I soaked a week in advance were a lot better hydrated and softer in the bread than the ones I soaked only 1 hour before starting or the ones that were not soaked at all. Use European butter if possible. European butter has higher butterfat content, so it enhances the bread with better butter flavor. Bake in tall paper molds for superior results. This Easter bread uses a very high hydration dough. This means that when it comes out of the oven it is very, very tender and soft. When you bake it in a metal pan, you need to unmold the bread immediately to prevent sogginess. Doing this can cause the bread to lean to the side, in an attempt to collapse from the weight of the tallness (is that a word?) of the bread. 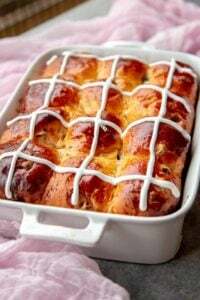 When you bake the Easter Bread in a paper mold, it allows the bread to cool down in the mold keeping the structural integrity of the bread, without getting soggy. This is more important if you want to bake a tall Paska, than if you bake the minis. In place of sprinkles, you can use these White Chocolate Crispearls. They have a rice crispies type of center, coated in good quality white chocolate. They are sold in plain white chocolate color. Use any color of edible pearl dust to color them preferred color. If you’re wondering how you can color the little white chocolate beads, it is super easy. Just add the crispiearls to a small container, then sprinkle some of the pearl dust over them. Next, shake it around until the crispearls are all coated. FAQ – Why is my easter bread dough too runny? Should I add more flour? If you measured your ingredients properly, do not add more flour. Before adding the butter the dough will be very soft, but not runny. Once you add the butter the easter bread dough will become a lot softer and if you have added very warm/soft butter or your house is too hot, the dough will be runny. Even when adding cold but maleable butter like the recipe requires the dough is still on the runny side, but if your butter is too warm it will be even more so. Having a runny dough is not at all a problem if you plan to refrigerate the dough (best practice). Once refrigerated, the dough will firm up considerably and will be a lot easier to work with. So, trust the recipe place your runny dough in the fridge and it will be ok. If you don’t have the time for refrigeration, just allow the dough to proof until doubled in size as is (runny), then use very oiled hands to help you shape the dough and place it into the molds. If you do not oil your hands you will have one sticky mess. This recipe uses typical Brioche Bread ingredients, such as eggs, butter, flour, sugar, and yeast. If using add-ins, choose your favorite dried fruits and decide if you want to use just one kind of several. Traditionally Paska is made with raisins, but I add white chocolate chips for extra sweetness and flavor, as well as dried cranberries, dried blueberries, and orange zest. Start by pre-soaking the dried fruits. Then, drain and paper towel dry. Start by making the brioche dough. Add all wet ingredients including sugar, top with flour and yeast. Knead until smooth and elastic, then add butter and salt and knead those in too. Lastly, add the dried fruits and knead them in. For best results, cover and refrigerate the dough for at least 4 hours or up to 2 days. then, The dough will proof/rise slightly but not too much. The pictures are from a doubled batch of Easter Bread. Remove from the fridge, shape the dough and place into molds. If using cans for molds, line them with parchment paper. Molds should be filled halfway with dough. Once doubled in size, brush the tops with egg yolks. To use cans for molds: with a can opener cut off the top and bottomm. Line the cans with parchment paper and place on a parchment lined baking sheet, spacing them apart to promote even baking. For easier removal of the Easter Bread from the paper/carton molds you can spray the inside with the non stick spray. Once baked, allow to cool completely. If you baked in the cans, remove from the can immediately and allow to cool on a rack. While the bread is cooling, make the powdered sugar glaze / Royal Icing glaze. Then, dip the top of each Paka into the whipped powdered sugar and sprinkle with sprinkles right away. If you wish to have drizzles, fill a pastry bag and draw the drizzles out by going up and down where you want the drizzles to be. How to Store the Paska Easter Bread? You can store the Easter Bread under a cake dome or in a closed container to prevent drying out. You can also freeze it, wrapping it tightly with plastic wrap for up to a month. If freezing, do not top with glaze until after defrosted. What to make with leftover Easter Bread? 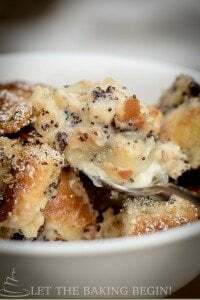 Use the Easter bread to make this delicious French Toast Casserole (use Easter Bread in place of Poppy Seed pastries). Blueberry White Chocolate Bread Wreath – it makes bomb toast! Great recipe! I was scared to try it but went ahead anyway. It turned out so so yummy. The inside was so soft and delicious! Hi , so when do we add in the salt? Hi Marina. After taking it out of the fridge and shaping it does it need to stand and proof again? Yes it does. Remove from the fridge, shape, allow to proof and double in size, then bake. Oh, wow!!! Thank you so much for sharing the recipe! It looks so delicious and sweet! Thank you so much for your comment Andrew! Yes, you can easily make it in a loaf pan. I would split it between two loaf pans though, just so that it doesn’t overflow.